A new printing solution for your smart phone is now available on iPhone. 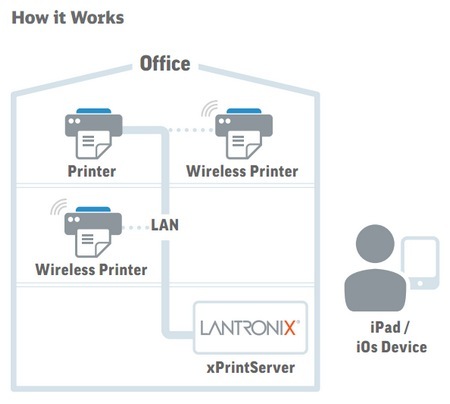 Lantronix launched x-Printserver for iPhone, iPad & iPod touch that transforms your iPhone in to printing device. Various printing solutions were available that helps in wireless printing but all those are for particular brand like we say ePrint an Apple wireless printing solution works only on HP printer. As with many, they also work with particular brand. Lantronix’s x-Printserver is a solution of above problems. This gadget works with almost all printers. You just need an Apple device, any printer & wireless connection. You can say it’s a Plug & Print wireless hub that doesn’t need any software, driver or applications to be installed. Roughly the size of iPhone this offers “Hassle free printing”. Multiple USB printers: One printer supports multiple USB printers & unlimited ios devices (Iphone, iPod, iPad) and any number of users could use it. Print What you want: What you can read on your ios device it prints. Economical: Home Edition requires almost 1 watt power. No software: No need of spending money on software etc. This home edition comes with USB port & Ethernet ports. It also adds support for USB printers & 2 network printers. You can use this USB printer in to network printer. Lantronix vice president of product management Mak Manesh added: “We are incredibly excited to launch the newest member in the award-winning xPrintServer family”. Gadget will begin shipping in July 2012 and is available for pre-ordering now at www.Lantronix.com for $99.95. Compatible with ios 4.2 or above.